Here is part 3 of the Core Training routine. As you can see we will be using “equipment” in this section. Enjoy this weeks challenge. As always feedback is welcomed. Sit slightly forward of the top of the dome. Place your hands on the sides of the dome for support, lean back slightly; lift your legs off the floor, about chest height. Slowly lean back and extend your legs to almost parallel to the floor. Pause for 6-10 seconds at this point, then flex your hips and knees and return to the start. Lie with your lower back in the center of the dome. Legs extended straight out in front, a hip width apart, placing your hands behind your head for support. Lean back slightly until you feel a stretch (not too much) in abdominal muscles. Slowly curl up, keeping core tight, pause at the top of the movement. Slowly and with control lower to the start position. lean back slightly, with a 90 degree bend at the knees, close to chest level. Your feet, ankle, knees and inner thighs should touch each other through out the exercise. Slowly twist and lower your legs to the right at the same time rotating your torso to the left, pause briefly then switch to the other side. Lie on your side, with your waist on top of the dome. Stagger your stance, meaning placing your top leg slightly in front of the bottom leg. Place your hands behind, keep the elbows wide, and lower bottom elbow towards the floor, to the point where you feel a nice stretch in your side. Using your oblique muscles, lift away from the floor, pause at this point. Slowly lower to start. Repeat on the opposite side. 5. Swimming on the Bosu 2-3 Sets 10 “flutters” on each side. 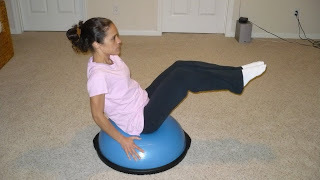 Lie on the dome with your hips and abs in the center. Legs extended behind you and your arms extended in front. 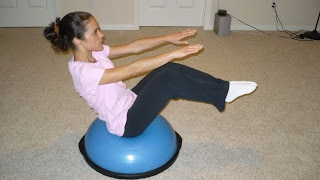 Keep your abdominals contracted and lifted throughout the exercise. Exhale as you lift your right leg and left arm up and away from the floor; lift your limbs as high as you can without bending at the elbow or knee. Inhale as you switch the legs and arms, reaching the left leg and right arm up as you lower the right leg and left arm. This is one repetition.